EXECUTIVE, BOTH SETS OF TIRES, HEAD UP DISP. Here is a rare find. 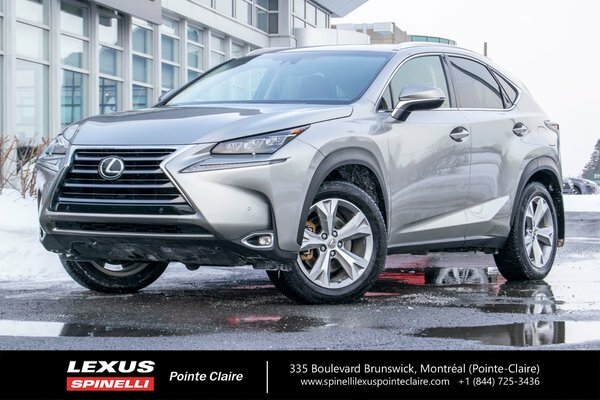 This 2015 LEXUS NX 200T with the EXECUTIVE package is the highest of the equipment groups for Lexus, (along with the F Sport 3 pkg). This high end Mid siz SUV was taken in on trade by one of Spinelli Lexus Pointe-Claire's loyal customers. Only one owner. Purchased new and maintained at Spinelli Lexus Pointe-Claire. Never accidented. CARFAX and Lexus Canada vehicle history report available. Remainder of Lexus warranty until October 23, 2021 or 110 000 kms. Inspected by our Lexus certified service department.